My boss used a lot–and I mean a lot–of postscript messages in his letters. They range from one paragraph to 4 or 5. These paragraphs are lengthy. What are your thoughts on the use of postscript in a business / legal correspondence? My initial thought is that in today’s electronic world, postscripts (or a PS at the end of a letter) are completely unnecessary because if it is an important part of a letter, it should be included in the body of the letter. I understand the need for a postscript in a handwritten multi-page letter where you might have forgotten something, so that you could add it at the end without redoing the entire letter, but not in a computer generated business letter. But what do the experts say? The Gregg Reference Manual says that effective use of a postscript will emphasize an idea that was deliberately left out of the body of the letter and will bring special attention to it. On the other hand, your reader may feel that your letter is poorly organized. Think about whether that is a chance you want to take. 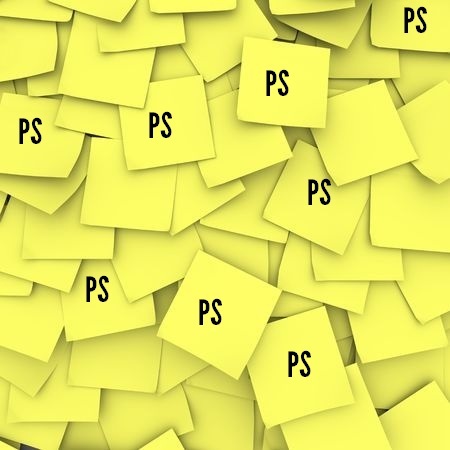 To me, I visualize the use of postscripts as a list on a piece of paper and then one Post-it note with an addition to the list, and then another Post-it note, and another until the list is obliterated by Post-it notes with extra information. If you’re going to use a “PS” for a particular purpose, leave a blank line between the copy notation and the PS and include a colon and one or two spaces after the “PS.” By the way, it is not “P.S.” (with periods) anymore since “postscript” is now spelled as one word. Do you have a nagging question that you would like answered? Leave it in the comments below or send an email to proofthatblog@gmail.com and I will do my best to answer your question.